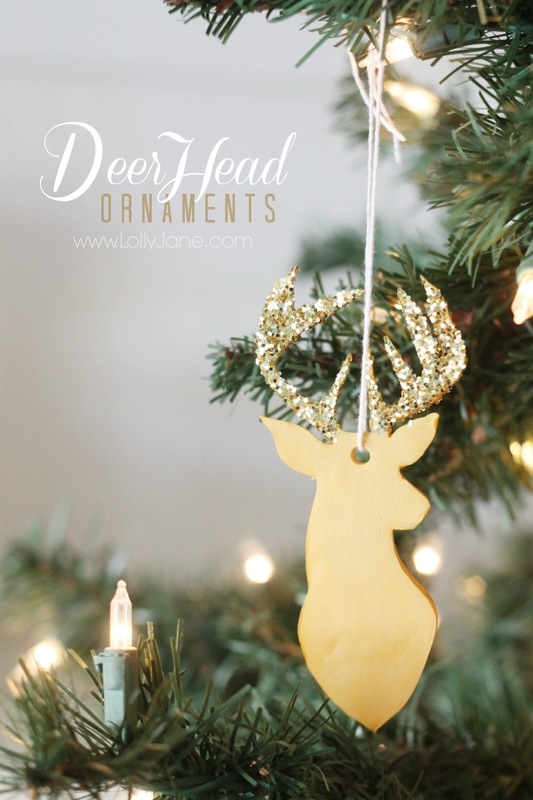 Okay we’re taking the deer head obsession to a new level…clay deer head ornaments! We had to!! 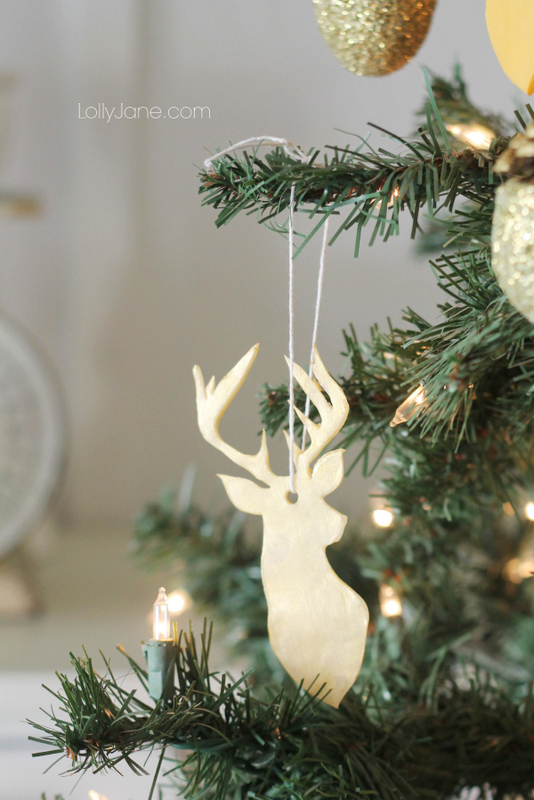 When DecoArt challenged it’s creative team to a homemade ornament giveaway (that’s right, you read giveaway, wahoo!) we knew we had to bring it! We’ve already made several ornaments this year and wanted to do something different. Read on to make your own little “dears” (love me a good pun) and to win win win! I actually made two different colored deer heads just for fun since I had so much clay. They were on sale for $1/each and I ended up using 2 of the rectangles that come in a pack so you can make 4 deer heads for $0.25/each…score! Here’s the second style I created, it has more of a translucent look to it using DA’s Dazzling Metallic. Print deer head stencil at 5″ tall on your regular printer. 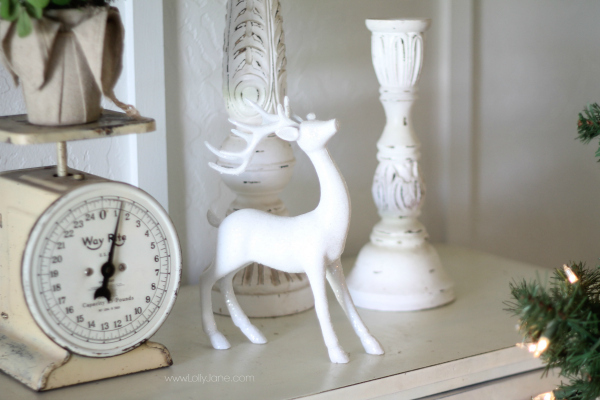 Cut out deer head and place on top of clay. 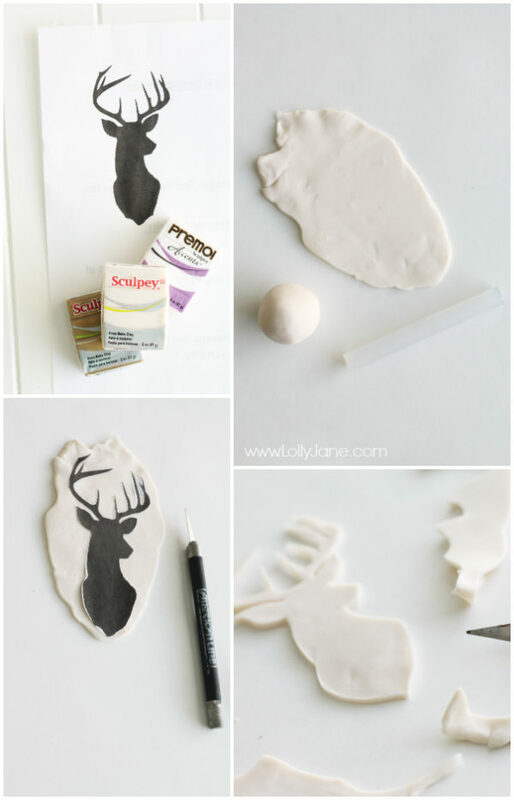 Cut our deer silhouette using an X-Acto knife. Using end of straw, poke hole through center of the clay to later hang. Bake at 225 degrees for 20 minutes until firm. 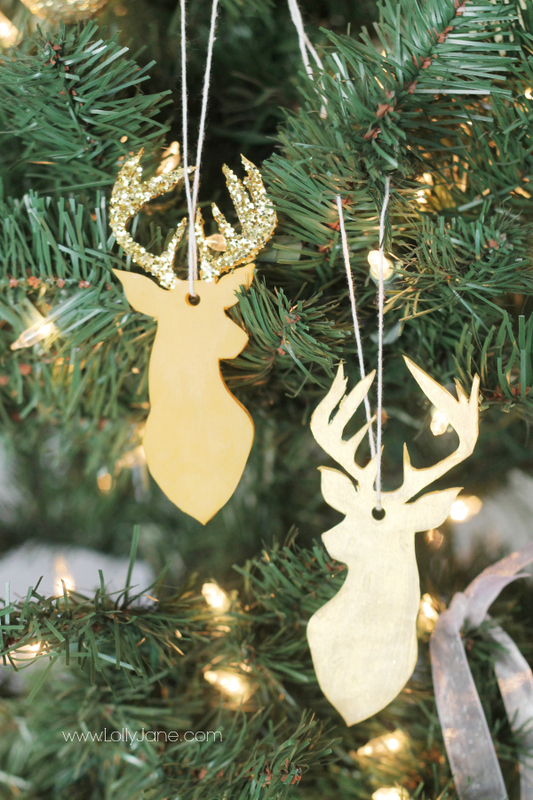 Paint one deer metallic gold and let dry. Paint second deer antique gold and let dry. 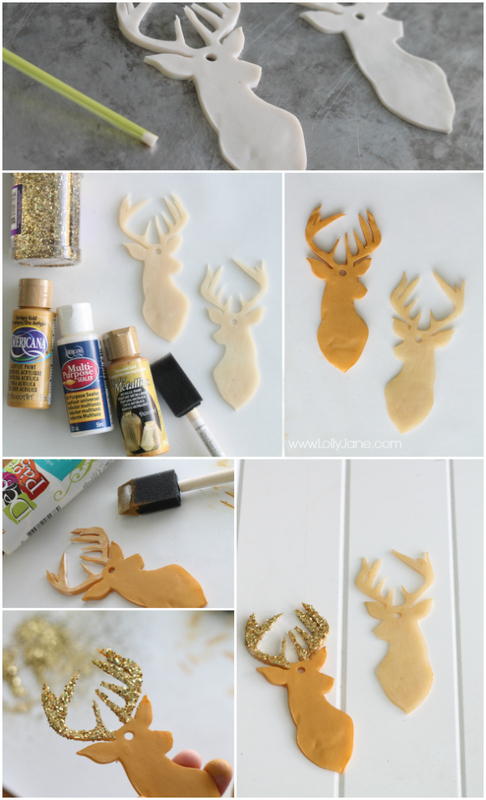 For glitter, coat antlers with decoupage and sprinkle with glitter. Let dry. *Optional: Seal metallic deer with decoupage and the base of the gold antique deer. Okay one last deer pic…isn’t this a cutie?? Nabbed it for less than $10, couldn’t resist! 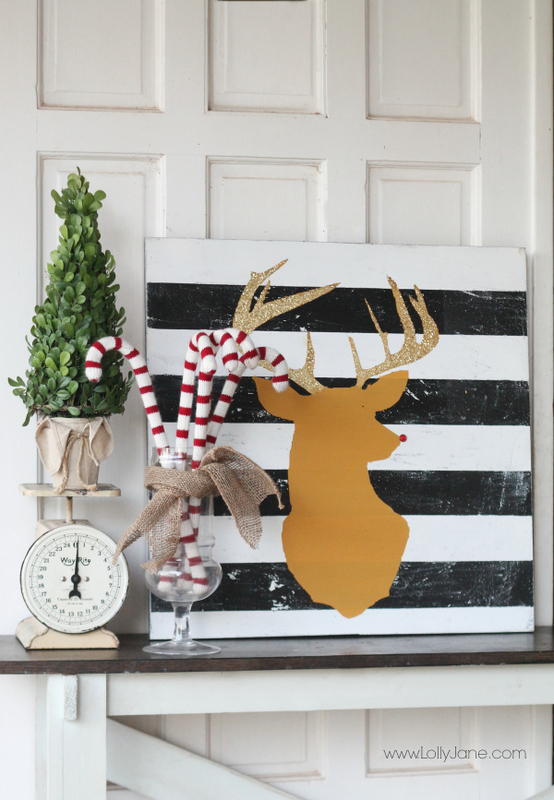 Visit all of our DecoArt posts, plus more deer decor like our glitter antler deer head art where we pulled inspiration for the above ornaments. Check out all of our Christmas decor and keep up with our FB, Twitter, Pinterest and Insta where we update daily. And subscribe to get LJ in your inbox so you don’t miss a thing! Now on to the giveaway! You can win all these goodies, what a fun Christmas gift to yourself (; Just enter the Rafflecopter below! Giveaway now closed. 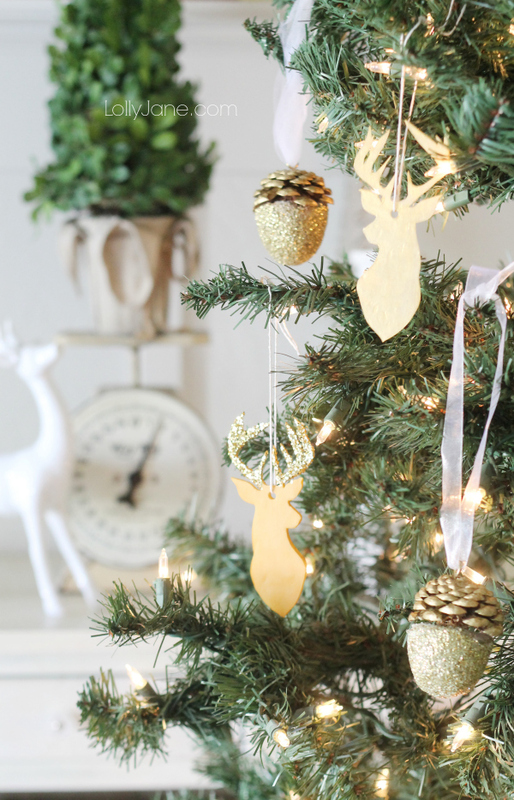 Trash to treasure: spindle ornaments! Seriously? Could y’all get any more creative? I think each time you come up with a new idea, your creativity grows exponentially. Uhm how could I not love these! 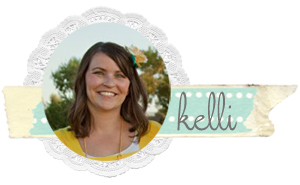 See how much fun polymer clay can be! ;D I’m obviously a fan! Love the deer heads!! I found several years ago an deer standing dressed in camo gear ornament. He also painted a deer head several years ago. Love the ornament! !